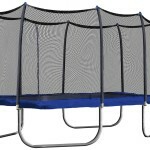 Super Jumper makes some of the best value trampolines without sacrificing strict safety standards. 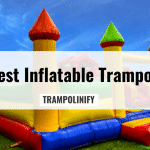 This particular trampoline features a weight limit that will allow you children to grow up or have friends over, while perhaps accommodating a few fun loving adults. You’ll never have to worry about upgrading to a heavy duty trampoline. By “combo”, Super Jumper means that this particular package includes the safety net system. You’ll still need ladders, games, and accessories to go with your trampoline. This model features a 330 pound weight limit, so multiple children can jump at the same time. 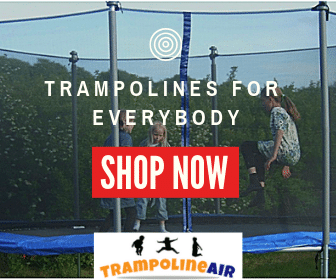 It’s an excellent choice with families with multiple children who may still want to use their trampoline into their teenage years. The safety net feature means you won’t have to worry about your children getting injured having fun with trampoline stunts. 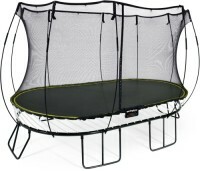 The shipping weight of this trampoline is 82 pounds, and its maximum weight capacity is 330 pounds. 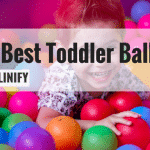 As mentioned, this is great for families with multiple children, or for when parents would enjoy bouncing with their kids. The mat offers 14 feet of jumping surface, providing everyone with enough room to move around. When things get really bouncy, this trampoline has a good stabilization system. 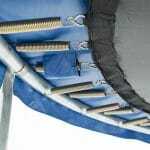 Additional poles mounted to the feet provide an extra level of stabilization, and they’re made of sturdy galvanized steel. You won’t have to worry about this trampoline tipping over on you. 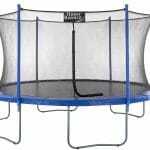 This trampoline comes with a mesh net enclosure that is designed to prevent toes and fingers from getting hung up in the webbing. It features a basic zipper door to let jumpers in and out, and the safety and security of preventing jumpers from falling out. The durable spring protection pad ensures that no one is going to get knocked around by the springs. Working in conjunction with the mesh enclosure net, these two features combined create a safe environment. 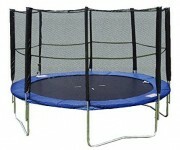 Parents can worry less knowing that their children are less prone to injury with this secure trampoline. Many users report the assembly of this model is super easy, with some having stated that it only took them around an hour to get the whole thing up and running. This trampoline doesn’t occupy a lot of space, so it’s not difficult to determine where to erect it. Its assembly means it’s easy to store this away during the colder months to prevent damaging the components. When Spring comes around, it’s just as easy to put it back up. The combination of durability and weight make this model an easy choice for families. It’s built sturdy and features a high weight limit, but it isn’t difficult to move. Moving the trampoline around the yard is easy, particularly for occasions where you’ll need to get the lawn mower underneath the area it covers. One or two adults can easily drag this model back and forth for easy yard maintenance. With the assembly being so easy, it’s easy to properly care for. It won’t be a nightmare when you need to take it down for the season, or even if you plan on moving house. Simple assembly is always a plus, and this trampoline will provide that for you. 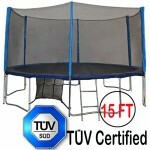 Any trampoline that comes with an enclosure safety net is beneficial over an open trampoline. It just so happens that this one has an extra durable net to protect your children while they’re bouncing. 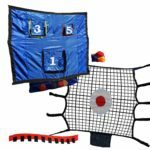 Not only will the net help contain your children and prevent them from tumbling onto the ground, it will also make games easier. The height of the safety net will help contain balls and other game accessories, preventing them from bouncing out. The weight limit means this trampoline can support a growing family. 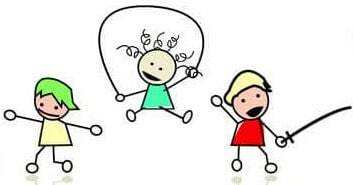 If you have another child, or someone has a sleepover birthday party, multiple children will be able to bounce at once safely. If you want to spend time with your children jumping on the trampoline, its 330 pound weight limit can accommodate an adult as well as a child or two. 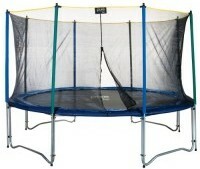 That makes this trampoline excellent for family bonding, between parents, children and siblings. It wasn’t easy to find many cons about this trampoline. Most reviewer complaints seem to relate to occasional defective parts, or user errors, which are bound to happen. Some reviewers complained that the blue cover slid around a lot while the youngsters jumped. As long as you’re assembling the trampoline as the instructions state, you should be fine. In the event you’ve received a part you think may be defective, simply contact the company about getting a replacement part. Even the users who experienced minor difficulties with the product went on to love their trampolines. This trampoline is tested and approved by children everywhere, and parents seem to agree. Many of them report that they’ve joined in on the fun, bouncing hours away with their little ones. Families love this fun space saver, stating it fits perfectly in the average back yard. Users say they feel safe and sturdy on their Super Jumper, and safety is a top priority with athletic activities. It’s great for playing games and keeping the young ones entertained for long periods of time, and you won’t have to worry about anyone getting any bumps and bruises in the process. Families with kids won’t want to pass this one up. 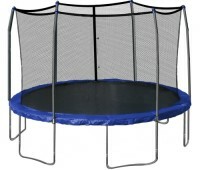 Its affordable price point in conjunction with everything it has to offer makes this trampoline an unbeatable deal. It’s important for children to get out and exercise, especially in modern times where children usually opt for electronic forms of entertainment, such as smartphones, tablets, video games, and television shows. 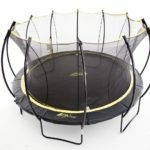 This trampoline is an excellent way to get your children healthy and active, and they’ll have just as much fun as they do with their indoor activities.